One thing that I notice this 13th Sunday after Pentecost is that the lessons for this morning are hard; they are scripture text that call us to warn others about sin, text about living honorably and a text that is a song that has us calling out to God to learn the way that God would have us live. We hear a text that has us crying out for God to help us turn our hearts to God’s decrees and not to selfish gain. These are words that all of us need to hear at one time or another in our lives. These are the hard texts that show up in the lectionary as I come to have a conversation with you Holy Family about the Ebola Outbreak crisis in West Africa and how we can use our hands to do the work that God has called us to do to make a difference. But before I really get started, I want to thank Ms. Tammy Jackson and Mrs. Elizabeth Hunter for the invitation to be with you. And I want to petition you church to hold the last two verses of this morning’s gospel lesson to heart as we talk about the history of, the suffering of and the current situation of our friends in West Africa. Indeed God has been there with the ELCA as we have built relationships of accompaniment with a number of Lutheran church bodies in West Africa, the Evangelical Lutheran Church in Sierra Leone, Lutheran Church in Senegal, the Lutheran Church of Christ in Nigeria and the Lutheran Church in Liberia. We have had these relationships for years. The Evangelical Lutheran Church in Sierra Leone and the Lutheran Church in Senegal are relatively young churches. The Lutheran Church of Christ in Nigeria just celebrated its one hundredth year last year. They are all very different churches with differing relationships. Yet we are all a part of the Lutheran Communion and church together in the world. But the relationship I am going to talk to you about this morning is with the Lutheran Church of Liberia. The LCL has been in existence for over one hundred and fifty years and we have had relationships with this church that goes back to our predecessor bodies. 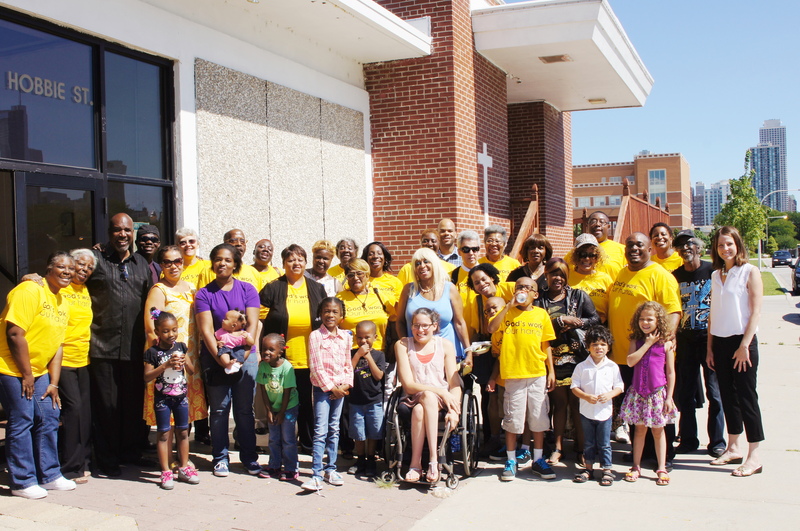 Part of this relationship is about walking together and being church in the world together which means for the ELCA that we send grants for church programs that help with youth, women’s and urban ministry. And ELCA World Hunger dollars from congregations all around the country go to help provide grants for the hospitals in Liberia. Phebe hospital a joint venture with the Episcopal Church and Curran hospital that is solely run by the LCL. We train pastors and theologians as you know from Ms. Jackson. One such theologian is the bishop of The Lutheran Church in Liberia who we know very well Rev. D. Jensen Seyenkulo who received his PHD from LSTC; I meet him when I was in seminary and he has served many years here in Chicago. Now he leads the LCL. Bishop Seyenkulo is a good bishop. In my visits to Liberia, I have had the privilege of watching his relationship with the people of the LCL. I have seen him laugh with them, dance with them and I have seen him call the people of the church together in prayer, to petition God on behalf of those in need of healing, comfort and care. Although, the 18th chapter of Matthew’s gospel is thought of as a mandate for correcting those who have done wrong, or moved away from the teaching of the community, even though it is a text that reminds us of binding and loosening things on earth and heaven in actuality I believe these texts are about community and connection, about truth telling and reconciliation, about how we live together as people of God. Again, words that we benefit from, if we indeed pay attention. Clearly God’s power and presence has shown itself again and again in the lives of our companions in Liberia. Liberia was the first Republic in Africa. Monrovia the capital city was born out of a movement of freed slaves who returned to Africa; they took the long journey back to the continent of Africa not returning to their villages or their countries of origins but, they forged a new country. They brought with them much of what they had seen and learned in America……. Even the Liberian flag is similiar to the flag of the United states strips and one star…….The capital city Monrovia was named after James Monroe an American president and 5% of Liberia’s population are known as Americo-Liberians. Many Liberians would consider themselves very much related to those of us who are descendants of those enslaved. They are friends, but they are also our brothers and sisters in circumstance and in Christ. Liberia has a very tumultous history In 1989, food shortages and inequalities pushed Liberia into a civil war, that lasted to 2005 they are just in the last nine years beginning to recover. We know about this history through the book and movie “Pray the Devil Back to Hell” and from hearing about and meeting Leymah Gbowee who had a huge role in putting to end this civil war. The infrastracture: roads, buildings and hospitals were just in the process of being restored. Liberians who had fled because of civil war were considering returning. When you travel to Liberia you can still see the ravages of war and UN peacekeepers in blue hats all over the place. When I visited Phebe hospital in December the son of Liberia’s Minister of Health, Walter Gwenigale Jr told us about the time in Liberia before the civil war when Phebe hospital was one of the leading hospitals in West Africa, now the hospital is in need of repairs, electrical re-wiring, equipment, improved water systems and so much more. And now our brothers and sisters in the LCL and all the people of Liberia are suffering because of an outbreak of the Ebola virus. And their infrastructures are being overwhelmed. This virus has terrified us every since we heard about modern day viruses in the 1995 movie Outbreak. That was make believe, but this is real. This hemoragic fever started in February in a rural village in Guinea which shares a border with Sierra Leone and Liberia and has spread like wildfire. Yes I am taking these two verses out of context, but I am not forgetting that they were read this morning in conjunctions with verses that attempt to tell us how to live as people of God, without attention to selfish gain, putting love at the center……. As you are doing by becoming aware, writing letters and raising money Holy Family. You are not thinking of yourselves but looking to help your brothers in sisters. That’s what these words of scripture are all about in Romans we hear: Owe no one anything, except to love one another… to love your neighbor as yourself… And we count on the power and presence of God to guide us. For sure this text from Matthew reminds us of that power and that presence of God with us here today and also with the people of West Africa………. Our prayer today, what you and I can agree on today and ask is that God move in this Ebola Virus outbreak, that God bring health and wholeness to the people of West Africa, that God use our hands to do what work that we can do in this circumstance, that God would comfort those who morn, that God would make a way where there seems to be no way, that God would show up and show out in this situation.